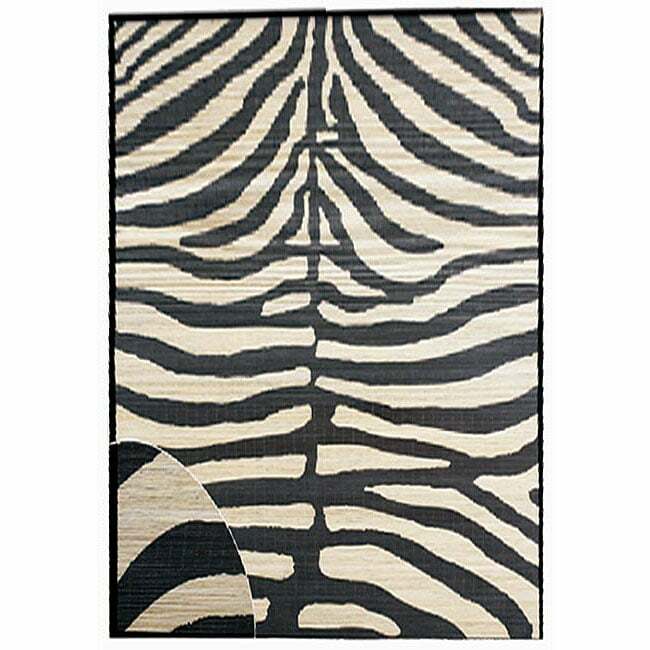 Liora Manne Safari Zebra Black Wool Rug (3'6 x 5'6) - 3'6" x 5'6"
Indoor Black/ Ivory Floral Area Rug (5' x 7'3) - 5' x 7'3"
Dimensions 5 ft. x 8 ft.
Great Product, but KNOW what you're getting! This rug was perfect for what I wanted! I have a studio divided for living and working space, and need a rug that withstands high-traffic, easy to clean, natural and doesn't affect my allergies. The bamboo wipes down easily and goes perfect with my decor. As some have said, it is a bit yellow-tinged, but you have to know what you ordered-it's BAMBOO! Have you ever seen a white tree? If you are eco-friendly, dust sensitive or just don't want to bother with cleanup as often, it's perfect! I purchased this rug for my walk-in closet. I knew it was bamboo, but honestly did not expect woven bamboo reeds (of course, had I read the description better, I see it says woven bamboo). I actually thought it was going to be woven bamboo to look more like cloth, sort of how bamboo is "woven" to make lush towels. In any rate, this is a beautiful product. It certainly looks like an outdoor rug and I may end up moving it from my closet to my veranda, but until then, it looks smashing in my closet. The construction is spot on and looks much more elegant that the measly price tag. It also has little rubber grip nubs on the back which help to keep it in place and thus you won't need a rug pad. I love it and I plan to buy more rugs from Overstock for the rest of my house. This is the most disappointed I have been in a purchase from Overstock.com. I was prepared from the previous reviews for the "white" not to be "white" - I however was not prepared for the black to be a washed out gray. It is not even close to the picture, it is hideous- if you are looking for a rug true to the pic DO NOT buy this one, find something else. While it seems to be well made the photo is a complete misrepresentation. 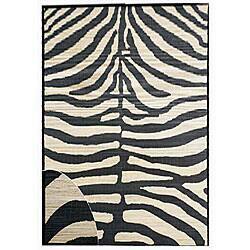 This is a great rug IF......you are looking for a silver/tan Zebra rug. I received it at 9:00pm last night....opened it and thought I was looking at the opposite side. I took a few pictures by placing some black items on the rug as reference, and then immediately placed the rug back into the package to be returned. Not for me. This was a good rug, but the color was wrong. Web showed it as black and said it only came in black. When I got the rug, the stripes were green and the edge was black. I was extremely disappointed. Very comtemporary - I mistakingly thought I was getting a wool rug but the bamboo rug is very nice. The print is not as dark in the picture though. But still I'd recommend it. Came broken. I returned this the second it showed up. Not to mention it was not at all what I thought. It is outlined in black fabric which makes the grey zebra stripes look even worse. Even if it wasn't broken I would not have used this rug! The Zebra pattern was greyish and the background tan. Not a good representation. Should be removed from the site. "Can this be used outside?" This is not good for outside use. Safavieh Florida Shag Scrollwork Elegance Cream/ Beige Rug - 5'3" x 7'6"
Safavieh Handmade Majesty Light Brown/ Beige Wool Rug - 7'-6" X 9'-6"